Left wing Labour leadership contender Jeremy Corbyn terrifies the Blairites political cartoon. 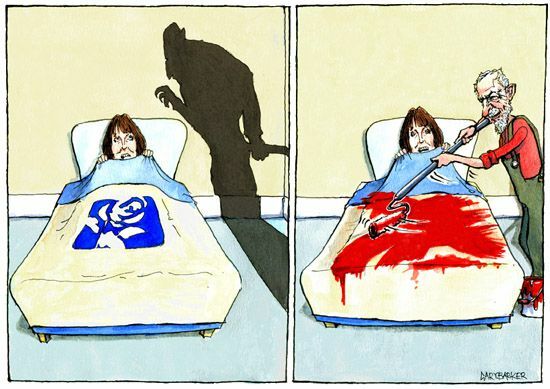 Shown here as the Nosfaratu bogeyman creeping up on Harriet Harman who lies in the blue Labour bed as Corbyn painst the blue out of their vision for the party and returns it to its red roots. Corbyn is proving to be far more popular with the grass roots Labour membership than he is with the parliamentary party who are more interested in keeping their seats than in doing what is right for the country as they brief against him. For weeks now they have queued up to pipe out anti-Corbyn propaganda while preaching the rhetoric of hard right appeasement in agreeing to abstain from voting in for the government’s welfare cuts instead of voting against it. This will no doubt play well among floating voters and Tory waverers but it will do nothing to win back the millions of votes Labour lost during the Blair years and its swing to the right. Before Labour can hope to govern they must first learn to oppose. We don’t have to agree with Corbyn’s policies but everyone should and must recognise that any democracy needs to hear both sides of every argument instead of the right only rhetoric of the past twenty years.